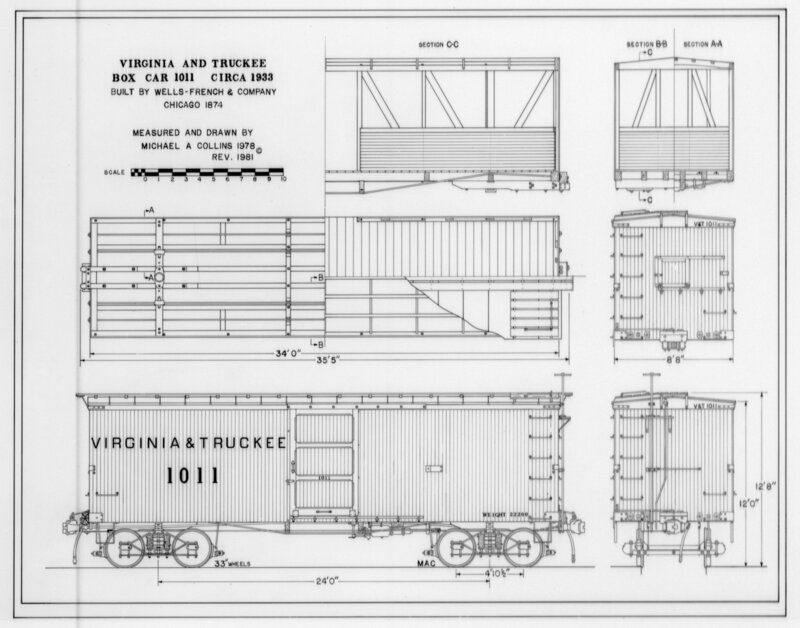 Primarily an ore and lumber hauling railroad, the Virginia & Truckee required merely a handful of box cars for their own use. Only eight such cars were on the road during its lifetime and they were used mostly to transport hay, grain and general merchandise. Of the eight, only six cars remain today, four of which are housed in the museum. Box Car No. 1011 was one of two built expressly for the V&T by the Chicago based firm of Wells, French & Co. in 1874 at a cost of $758 each. When completed, the 21,000 lb. wooden frame cars measured 34 feet 1 inch long, 9 feet wide and 14 feet high. 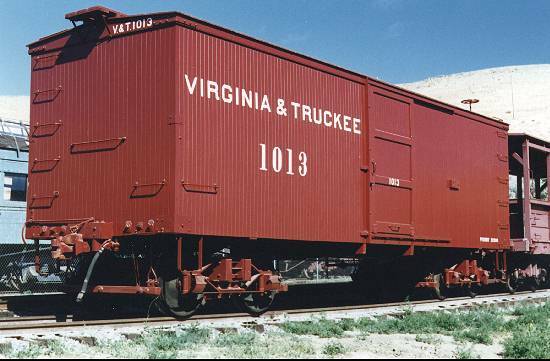 Box cars 1011 and 1013 were originally painted yellow, but were repainted red in the 1880's. Both entered service in June 1874 and were capable of carrying 30,000 lbs. of freight. They were commonly known as "hay cars" by the V&T, and could carry 68 bales, or 8 tons of hay. No. 1011 was equipped with the Sams “automatic” link and pin couplers and air brakes by February 1898. In 1902, the Sams couplers were replaced by more modern Tower automatic couplers. In 1909, after more than 30 years of active service, the box car was completely rebuilt, including new siding and additional safety features, to extend its serviceable life until 1938. By the 1930's, box car 1011 had received an end ventilator door, tin roof, and end roof foot boards. In 1938, Paramount Pictures purchased the car for a roll in their film “Union Pacific”. The studio reduced the roof height by several inches to match its other railroad equipment. Paramount sold No. 1011 to Short Line Enterprises in 1971. The car now resides in the Nevada State Railroad Museum, where it is presently awaiting restoration.